You are here: Home / Damp / Educating Building Surveying and architectural technologist students on damp diagnosis. Educating Building Surveying and architectural technologist students on damp diagnosis. Last Thursday I spent some time at Leeds Metropolitan University. 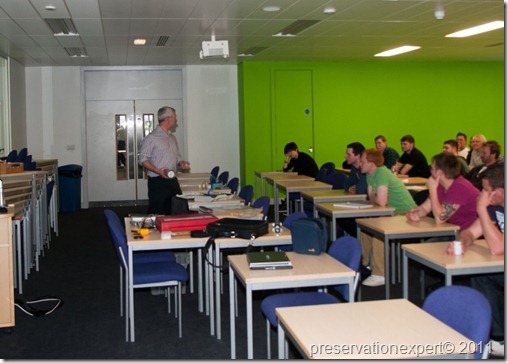 I was invited to give the students a lecture on damp diagnosis. The course tutor is a fan of this blog and wanted to give the students an early chance to get some information direct from the outside world, rather than via textbooks. I stayed down to earth and I think some of the students will want to know more about damp, which is great news and will benefit them and especially their clients and future employers. I jumped at the chance to pass on some nuggets of information and I took along lots of kit and such for the students to see and ask questions about. The forty or so students seemed engaged and after a hour or so we had a nice question and answer session, with the students being particularly interested in the role of salts in dampness on walls and chimneys. The use of conductivity moisture meters in finding profiles to help diagnosis and crucially, the limitations of these meters was covered. I demonstrated a ‘Speedy’ chemical moisture meter and we looked at data logging and simple chemical indicator strips and probes for detecting high RH values. The growth of condensation and mould problems related to our changing lifestyles and modern insulation regulations was covered too.. I don’t usually bring the insect collection out, but as expected some of the young ladies were fascinated and a bit grossed out too, when looking at the Death Watch Beetles, Wood Boring Weevill, Common Furniture Beetle and Biscuit Beetles – they especially hated the Varied and Two spot carpet beetles. Whilst damp was the main subject we looked at some spectacular Dry Rot outbreaks and close ups of fruiting bodies were shown, so the students could see what to look for. I also displayed some images from a dry rot outbreak caused by careless application of above ground damp proof membranes against damp walls. It was great fun and my thanks go Leeds Met for the invite; it was a pleasure meeting tomorrows surveyors.